Newly released files from the National Archive reveal Margaret Thatcher feared introducing GCSE exams would lower standards in Britain's schools. The changes went ahead - but the Prime Minister stopped short of a wider overhaul. Amid hundreds of thousands of files lives there are fascinating insight into governments past. The national archives released 'personal' documents from 1985 and 1986. It was the middle of Margaret Thatcher's premiership and for the first time her disdain for new GCSEs was revealed. She wanted to postpone their implementation and wrote to her Education Secretary Sir Keith Joseph to voice her concern. 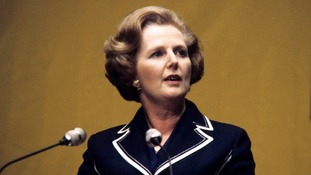 Mrs Thatcher was already in a long-running battle with teachers over pay. Proposals for radical changes to the curriculum just riled them further. The files also reveal she was firmly told that under here education had remained fundamentally nationalised. Praising it with a tick she asked for plans to introduce grant-aided schools. That would have been even more radical than GCSEs, but despite endorsing an academy programme she left it to her successors to implement it.